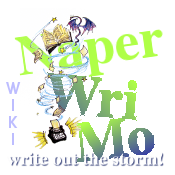 Difference between revisions of "Library Crawl 2018"
Welcome to the 2018 NaperWriMo Superhero Library Crawl, part of the local events supporting the USA::Illinois::Naperville region of National Novel Writing Month (NaNoWriMo). Be sure to consider attending some or all of our four planned workshops in October (as always, all of our events are free!). This page was last modified on 5 November 2018, at 09:29.